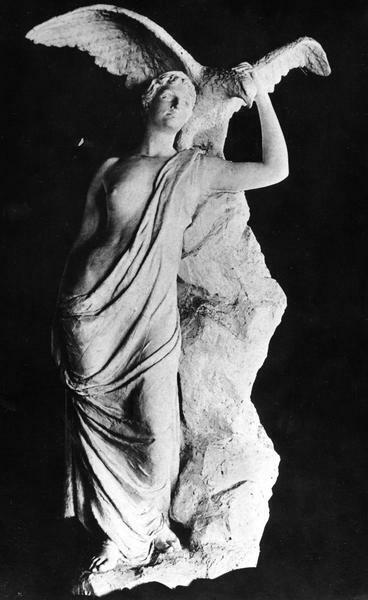 Marble sculpture "Genius of Wisconsin" created by Helen Farnsworth Mears. It was commissioned by the Milwaukee Women's Club and, after being executed in marble by the Piccirilli Brothers, it was displayed at the Columbian Exposition in 1893. "Genius" was located in the Rotunda of the third Wisconsin State Capitol before the turn of the century, but it escaped damage during the fire of 1904. Today it is on exhibit at the southeast entrance to the first floor (one story above ground) in the present Wisconsin State Capitol. Compare to Image ID: 23155 of "Genius" in the old Capitol.